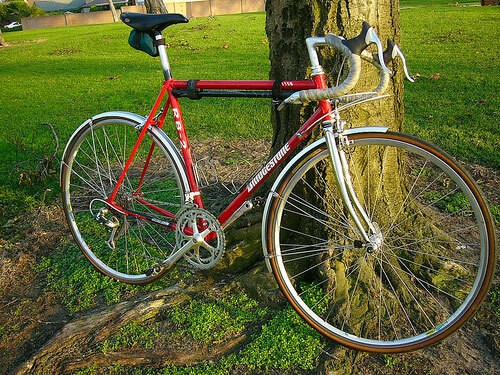 Here's my Bridgestone RB-2, from 1992 I believe. Absolutely nothing is stock, since I obtained it as a frame only. The idea was to build it as a mostly free bike with parts I had lying around, but keep with a mish-mash, thrity and reliable spirit of the GP-era RB-2. Granted, I have a much more extensive parts bin than most since I help manage a bike a shop and obtain choice bits from time to time. The parts are also not so much "free" as much as they are things I forgot the price to because they may have been pieces of old projects, etc. I attached a generic lugged touring fork (with some creative filing and grinding to accept the headset crown race). The wheelset is Wheelsmith- built 105 hubs to Mavic CXP 23 rims, covered with Conti Ultra 2000 700X25 tires. I used SKS fenders even though it doesn't rain here much. I like the look and the few times a year it does rain riding is so pleasureable. Drivetrain wise, I have Ultegra 8 speed barcons shifting a vintage XT rear derailleur and even older 600 front derailleur. The cassette is a 12-32 and the front crankset is a 600 with 42/52 rings. The chain is a cheap SRAM PC-58. I haven't really experimented with using a mountain cassette on a road bike but I like the range of gears I get mixed with a standardish double. The braking is done with Tiagra level Shimano levers. The front brake is an old Dura Ace long reach, the rear an old Shimano 600. The cockpit is a Kalloy post with a Regal saddle (favorite all time). 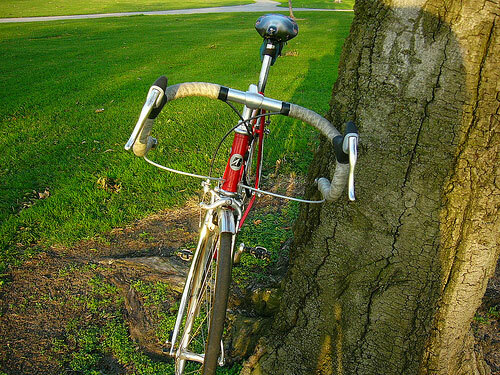 The stem is a short Specialized with an ITM Pista handlebar. Pedals are currently Time ATAC, but I play around with these. I have outfitted the bike with charmingly toussled array of accessories: Jandd bag, Blackburn frame pump, and a Planet Bike Alias 10W light (not pictured) when I have to ride home late from closing shop here in Orange County, California. This bike is mostly a short distance daily driver. Once I add a longer Nitto Tecno stem and Noodle bar it may get used for mellow club rides.